- Siilanyo who took the helmet of Somaliland nation in peaceful in 2010, while the wreckage of destroyed fighter jets still lies on Hargeisa’s bumpy airstrip, the scars of the conflict are rapidly fading, as bullet-riddled ruins are placed by a spurt of new buildings. It is a sensitive matter for fiercely independent Somaliland, keen to win favour with the international community by showing its commitment to fight piracy, but also wary since the conflicts are from Somalia. Even if we do not yet have the recognition of the international community we engage with world, and we hope and expect recognition will come soon. 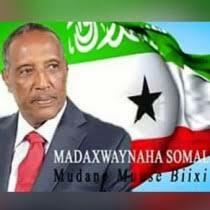 Somaliland will be playing an important role in horn of Africa. The history of Horn of Africa can not be complete without Somaliland input. Far back into antiquity, the Somalilanders were the most important traders, sailors and internationalists on the Eastern shores of the Red Sea. They traded with pre-colonial Nile valley, Egypt , Mesopotamia, India, China and Arabs. Very often they had drought and famine, but Somaliland had strong survival skills. With their ease of mobility, their cohesion, and general health and strength based on high protein diet, the nomadic pastoralism militarily and economically the most dominant factor over much of Horn of Africa. The colonisation by the British, who used the Somaliland coast of the vigil corridor over the Red Sea maritime activities, badly stagnated Somaliland’s growth. At independence, they had no proper schools, no hospital facilities, no transport lay out,and development projection. With independence, the Somalilanders did not have proper leadership to plan infrastructure development. In 1991, they have remained great traders, fishermen, and camel-keepers. It is also whispered that they are sitting on vast oil fields as it has been announced recently. We should all the Somalilanders to join the Horn of African fraternity.